In the Chinese culture, there are different forms of martial arts, which are most famous all around the country and in the world as well. However, unknown to many, the most ancient is Shaolin Wushu, also called Shaolin Quan. This form of fight was developed in the Shaolin Temple back in the 1500s, and until now, it is commonly practised. At Moon Games, there is a new slot game which is themed on this form of martial art, and it is Shaolin Spin Slot. Created by iSoftBet, this online slot game comes loaded with 5 reels and 243 ways to win. You will find an impressive background as you kick-start this game; it features golden dragons and Chinese calligraphy, which really makes you feel like you are in China. When you are playing this game, the topflight symbols you will see rolling on the reels are Wushu Masters, Dragon, Nunchaku, Shaolin Temple, Bird and the usual card values 9, 10, J, Q, K and A. Begin a divine gaming experience on this Chinese themed slot on either a tablet, a laptop or a mobile phone. You can do so by first selecting your bet value. This game also consists of the Auto Spin option which enables the automated gameplay of specific numbers of spins. You can also listen to the captivating soundtrack as you play, to feel the real Chinese atmosphere. Bet Levels: You won’t find any Bet Levels on this online slot game. Amount of Paylines Selection: This game is a 243 ways to win one and these cannot be changed at any point. Coin Values: You can adjust your coin values and your Bet Per Way on the Coin Values Tab. You can accordingly select any bets from £0.25 to £125.00. The Fighter symbol acts as the scatter of Shaolin Spin Slot and it helps to launch the Free Spins Feature. On Shaolin Spin Slot, the wild symbol is represented by the Wild Logo. This symbol appears only on reels 5, 4 and 3, and can expand for better winning combinations. Also, the wild replaces any other symbols, bar the scatter. 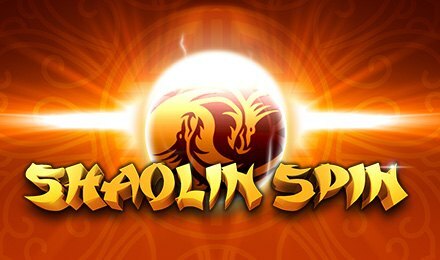 If you are ready for a challenge, launch Shaolin Spin Slot and show your skills!